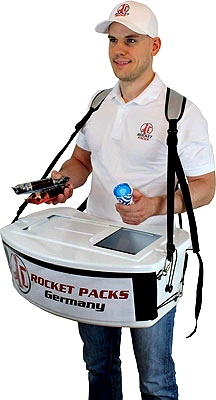 In 1995, Rocketpacks started the mobile dispensing in Germany. This unique formula allows Rocketpacks to serve your guests in a fantastic way, creating the situation where your guests will never have to stand with an empty glass, and you will generate an extra turnover. 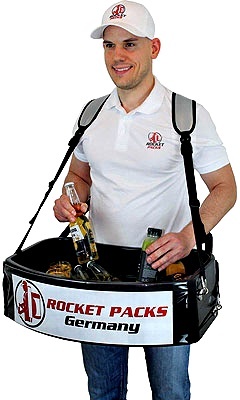 Rocketpacks can be used for all sorts of parties and events. Anywhere the catering is unable to serve everybody, Rocketpacks offers precisely the extra service needed so everybody can enjoy a drink without having to queue up. Rocketpacks is a portable backpack manufacturing company which equips the right sort of young people with backpack dispensers for all your events, parties, etc.. The company sells packs that can keep a nine or eleven liter of beer cool so that drinkers can be served on the move. These are offered in different hole widths. They can be exchanged at any time and provide a safe and strong grip at the same time as easy removal of the cups. Maximum diameter of the cup approx. 89 mm. A highly functional and at the same time robust technology combines optimally thought-out detailed solutions. devil-swooping-in-on-a-bad-dream pair of black wings) and offers freshly-tapped beer for thirsty patrons. The Central barrel area ensures a quick, one-handed transfer and taking of the barrel. In addition, the barrel can still be turned for faster connection to the lines. If the unit is newly fitted, the lid is simply folded and closed by a zipper. But also at sports events where nobody wants to miss a second, we can meet your needs by serving delicious cold soft drinks or beer, or even hot cups of coffee. as Coca-Cola, Toyota, Wella AG, Krombacher, Becks, Bitburger, Jägermeister, Nestle and many other well-known brand names in the past and has been represented at numerous events such as the "Love Parade", "Tour de France", "Formel Eins" etc.